Recommended Citation: D’Onofrio, M, T Jarmoszko, J E Lee-Partridge, and O Petkova. Sustainability and Greening through Information Technology Management. In The Proceedings of the Conference on Information Systems Applied Research 2009, v 2 (Washington DC): §4135. ISSN: 0000-0000. 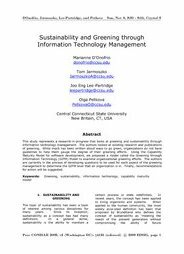 This study represents a research-in-progress that looks at greening and sustainability through information technology management. The authors looked at existing research and publications of greening. While much has been written about ways to go green, organizations do not have guidelines to help them gauge the degree of their greening efforts. Using the Capability Maturity Model for software development, we proposed a model called the Greening through Information Technology (GITM) Model to examine organizational greening efforts. The authors are currently in the process of developing questions to be used for each aspect of the greening management to determine the GITM level that an organization is in. Finally, recommendations for action will be suggested.